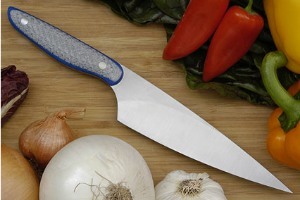 HCK Chef's Knife with Silver Twill and Blue G10 - 6 1/2 in. 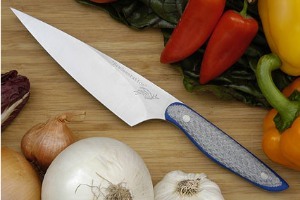 Product Description for HCK Chef's Knife with Silver Twill and Blue G10 - 6 1/2 in. 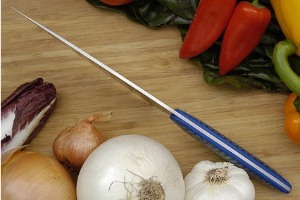 Description: Thomas' experience working as a professional chef shines through in this chef's knife. His design is effective and feels great in the hand. The blade has a strong distal taper for balance and excellent edge geometry for perfect cutting. The steel, S30V is considered by many to be the ideal steel for chef's knives. It is extremely hard and takes on a superior razor edge and holds it. 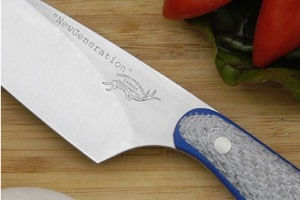 The unique handle was created by layering blue G10 with silver twill. The resulting handle is extremely durable as well as attractive - a perfect choice for a knife that is sure to become a chef's favorite. Excellent fit and finish throughout.